Perfect additions whether you enjoy testing your skills off-road, or just appreciate the rugged styling they offer. 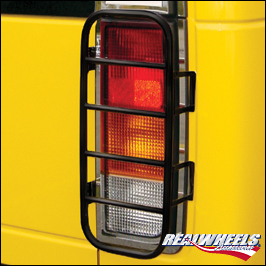 These stainless steel guards are buffed and then electro-statically powder coated for durability. Installation is quick & easy. Only RealWheels offers Hummer enthusiasts a LIFETIME Limited warranty, and the confidence of large diameter stainless steel construction. All guards will eventually encounter flying road debris, salt, bugs, off-road brush or other obstacles. Don’t settle for chrome or paint over regular steel that can rust once even the smallest surface chips occur. All RealWheels guards are genuine, American-made quality.